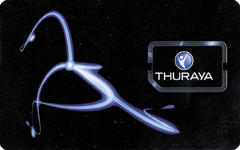 Thuraya NOVA Prepaid Plan provides discounted rates for calls originating from 142 countries and areas in Africa, Asia, Europe and the Pacific — as low as 85 cents per minute! Thuraya NOVA plan will work outside the discounted origination areas, however, the regular calling rate will apply to all calls. Thuraya NOVA plan has initial validity of one (1) year from first call. If the account is NOT refilled within the grace period, the entire unused balance will be reset to zero and the account will be permanently deactivated. The majority of world countries and territories fall in Band 1 destinations (see the Calling Rates table above). From Apr 1, 2019: A minimum $20 airtime top-up will be required every 365 days to maintain a positive account balance. Apr 10, 2019: Initial amount of preloaded airtime decreased from $20 to $10. Apr 10, 2019: The account renewal fee increase from $10 to $39, due annually (instead of biennially). Apr 10, 2019: Mali is no longer a discounted rate origination area.